Whenever I’m asked for a good go-to wine to pair with summertime meals by the grill, I immediately think of Zinfandel or Primitivo. And whenever I’m asked for a good go-to wine for heartier wintertime dishes like braised short ribs or stovetop burgers--well, I think of Zin and Primitivo then, too. These are wines that deserve to be considered and consumed throughout the year. Something about their typically exuberant berry fruit, balanced out by a telltale hit of spice and, often, licorice, makes them exceptionally useful pairing partners for a wide range of dishes. “Many American wine drinkers have found their way to Puglia via a grape called primitivo. Several years ago, researchers at UC Davis proclaimed that primitivo, thought to be a native vine of Puglia, was genetically identical to American red zinfandel — and thus the progenitor of all those rich, spicy “zins” from the likes of Turley and Ridge. This Italian-American connection got a fair amount of press, to the point where at least one Puglian primitivo producer, Sinfarossa, began using the word “zinfandel” on labels to enhance its wine’s international appeal. Of course, all of this, while fascinating, is really secondary to what matters most--the juice in the glass. And when it comes to both Primitivo and Zinfandel, the pleasures are many and varied both when the wines are enjoyed on their own and when paired with food. 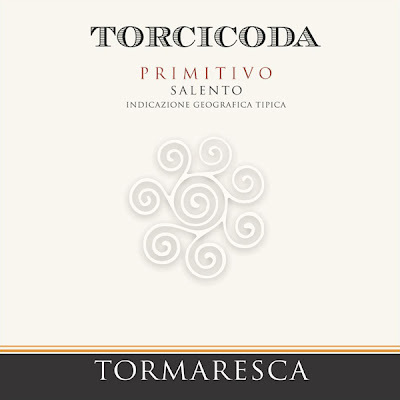 I recently tasted one of the most enjoyable Primitivos I’ve had in a long time, the Tormaresca “Torcicoda” 2003 from Salento. This wine is everything that great Primitivo should be, the color starting to show its maturity in hints of brick and amber at the edges (though the center still retains its glistening black-cherry hue), the nose intriguing with its aromas of bonfire, scorched earth, dried mushrooms, black licorice, lavender, warm clay and, with some air, hints vanilla and nutmeg and the intimation of blackberries. All of this complexity on the nose leads to flavors of black raspberry, blueberry, mixed-berry compote, more hints of licorice, and an aromatic element at the back of the soft palate that reminded me of black peppercorn. The maturity also makes itself known in the texture of the wine, an infinitely giving silkiness that carries on through a finish that runs the gamut from scorched earth to an exotic note of sandalwood. The Tormaresca “Torcicoda,” in fact, demonstrates everything that great Primitivo (and Zinfandel) can achieve. And the fact that it’s evolved into such a complex wine, without losing the qualities that make the grape variety so charming in the first place, is a real sign of great fruit and smart winemaking. I can’t imagine a better wine to pair with dinner...no matter what’s on the menu.